Welcome to the Six of One subscription page where you can renew your membership with any major credit card. Simply identify your zone and select the appropriate payment from the PayPal buttons below and you will be transferred to a safe and secure server where the transaction will be handled by PayPal. Zones 2 and 3 are more expensive than Zone 1 because of the higher postage costs for mailouts to Europe and the Rest of the World. Please note there is an additional PayPal admin fee charge which Six of One is unable to cover. The PayPal admin fees are as follows: UK £1.20; Europe £1.60; USA/Canada/ROW £2.00. Joint memberships are available for couples or families who do not require additional society magazines. 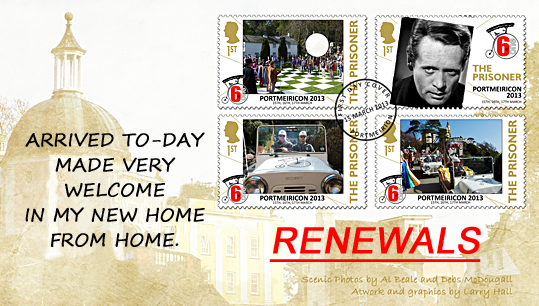 Each joint membership is £3.00 extra above the single membership rate and allows joint members to register and attend Prisoner conventions held in Portmeirion each year (or any other society events that are arranged from time to time), although they will not receive more than one society magazine per household per issue. There are three 'Orange Alert' society magazine mailouts per subscription year, i.e. Summer, Winter and Spring. If couples or families want their own copies of the society magazine, then they will need to join Six of One individually, each paying the normal single membership fee - thank you. Six of One is an informal society which was formed at the end of 1976 for the appreciation of the television series "The Prisoner". Names and addresses of members are held on a secure encrypted database. These details are held in trust and never passed to third parties and no other data is held. Subscriptions paid on-line or by post are used mainly for the production, printing and posting of society mailings. The names of persons administrating Six of One from time to time appear in the society's magazines. If any information is required about the society please refer to our society details which are linked to on the menu bar above. A copy is also provided to all new members. Applications are subject to acceptance - if your joining application cannot be accepted, a refund will be made to you.